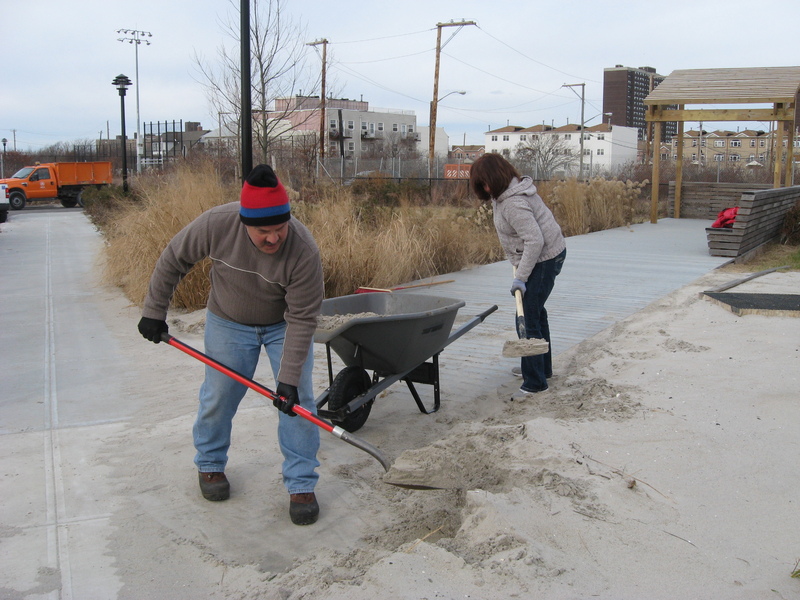 Seth Wollney, naturalist and program associate at the Staten Island Museum, sent us an email describing the damage Sandy has caused to certain areas in Staten Island, including Wolfe’s Pond Park and Great Kills Park among others. 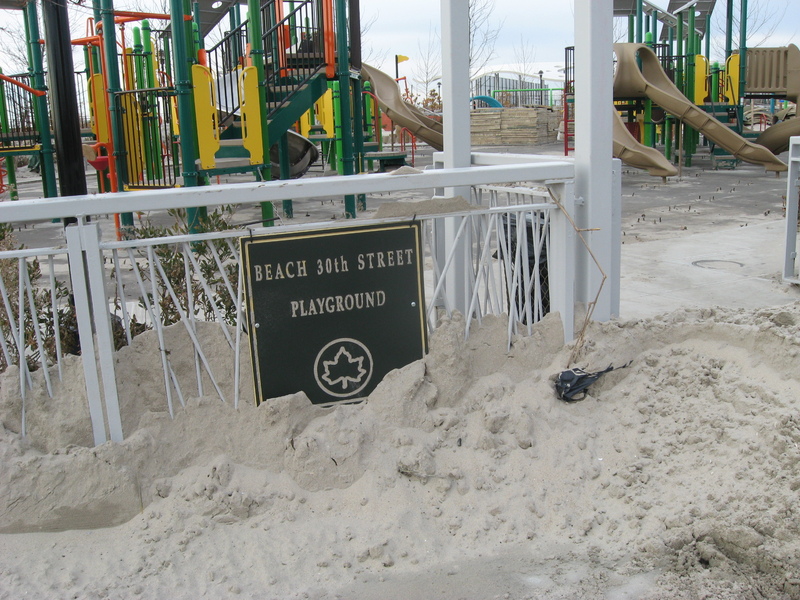 Due to the low elevation of Staten Island’s east and south shores, the Island was one of the hardest hit areas of the city during Hurricane Sandy on Oct. 29th this year. 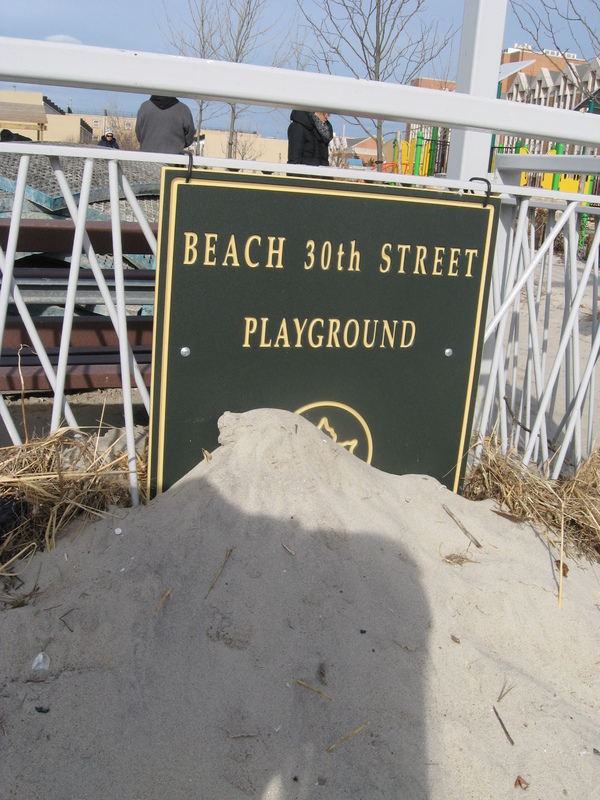 While much media attention has been given to our “forgotten borough” in terms of the human impacts, there are also substantial effects to our beach front. 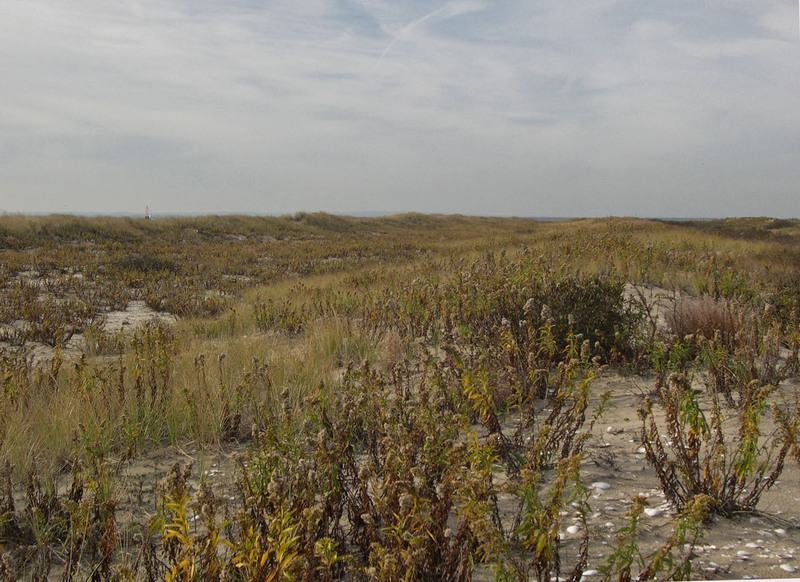 The Lenape name for the island “Aquehonga“ can be translated as “where the sand cliffs end”. 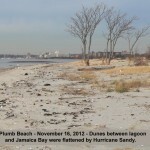 If the Lenape witnessed the island after Sandy that name might not have been given to describe the island. While there still are cliffs, or bluffs as we commonly refer to these features, at such locations as Mt. Loretto Unique Area or the north-west facing Conference House Park, there were approximately 3.7 kilometers of bluffs or sloped beach front flattened in one way or another by Sandy along the island’s east and south shores. The loss of certain sections of bayside bluffs is going to mean the loss of at least one established bank swallow colony at Great Kills Park and relocation of a colony at Mt. Loretto Unique Area. Many local and city birders are familiar with the “salt flats” at Great Kills as a waterfowl, shorebird, and gull location, but few realized that there was a healthy colony of bank swallows at the bluffs just west of the flats during the late spring and summer for the last decade. 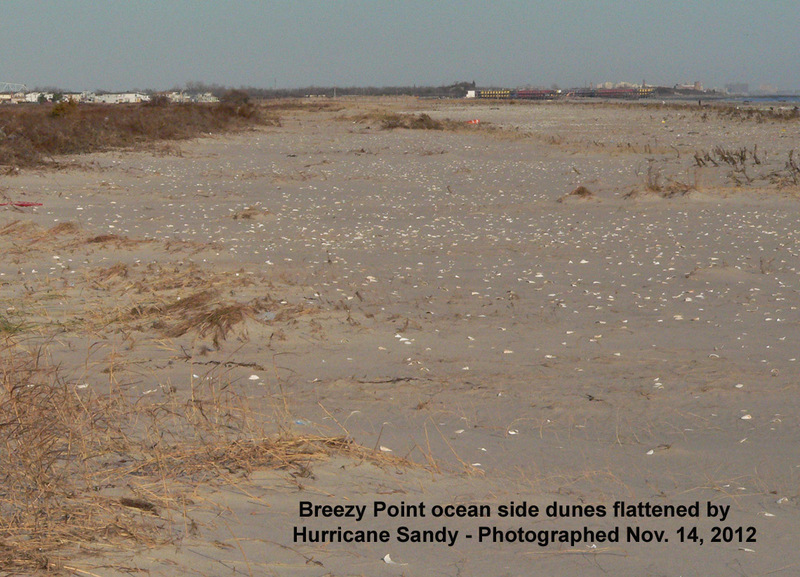 Sandy’s actions have caused these bluffs to erode, extending the sloped beach inland about 45 feet from where the colony (bluffs) used to stand, up to the sidewalk-parking area. Likewise, a smaller but active bank swallow colony located on the bluffs at Mt. Loretto Unique Area was also wiped out, but as these bluffs are still standing there is hope the swallows and a pair of belted kingfishers will return to this location next summer. All of our concerns came true as we got closer to the hard-hit areas. Passing by our beloved Jamaica Bay Wildlife Refuge, seeing all the scattered trash and the closed signs hit me hard. Driving through Broad Channel we witnessed boats in the street, stores closed and gutted, homes destroyed and without power, boat docks wrecked and mounds of items on the street that a month ago were deemed prize possessions. As we approached our destination by the beach, the devastation became worse. Sand was everywhere! 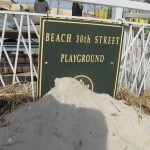 The dunes that once existed were now gone. 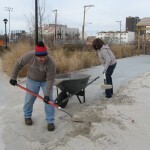 The surge had washed the sand onto the inland streets and facilities. 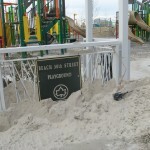 The playground we were to clean had three to four feet of sand covering the jungle gyms. 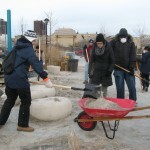 Teams of volunteers were given shovels, buckets and wheelbarrows and were asked to start removing the sand. 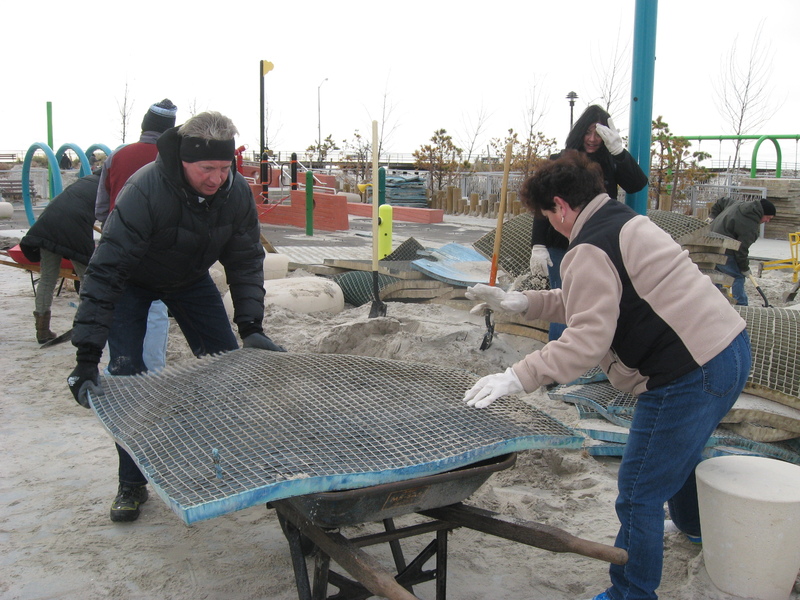 All of this had to be done by hand, as the playground equipment would have been destroyed by construction vehicles. For three long hours, we excavated two areas that still needed attention. 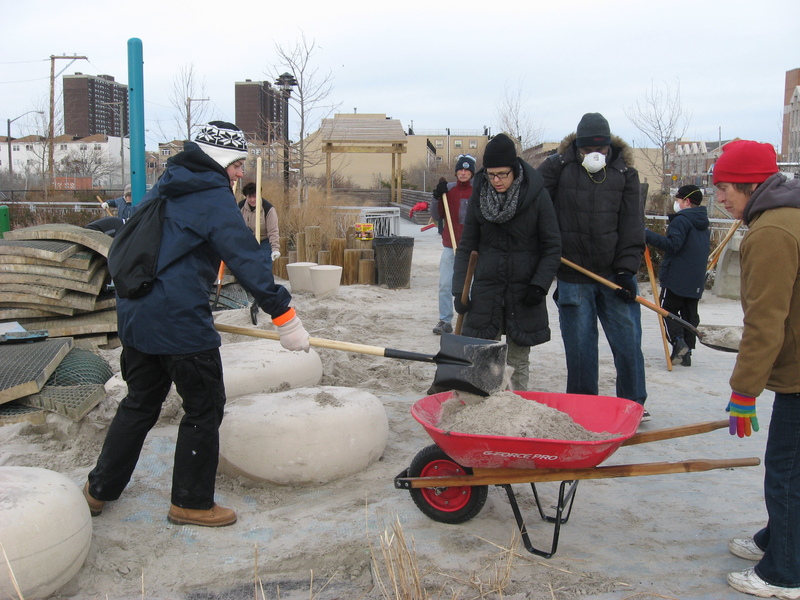 It was truly amazing to all 30 volunteers as we watched the playground equipment unearth and the flower gardens start to reappear. We were all pleased with our accomplishments for the day. As we left the playground that afternoon, we had smiles on our faces knowing that we helped to try to restore this beautiful park. However, our smiles seemed to fade as we approached all the other areas still in need of restoration or assistance: the soccer field, picnic tables and benches covered in several feet of sand, the residents still without power or homes to live in, the lack of wildlife in the area and the streets covered with debris. As upsetting as this was, we knew that it would have to wait for another day. 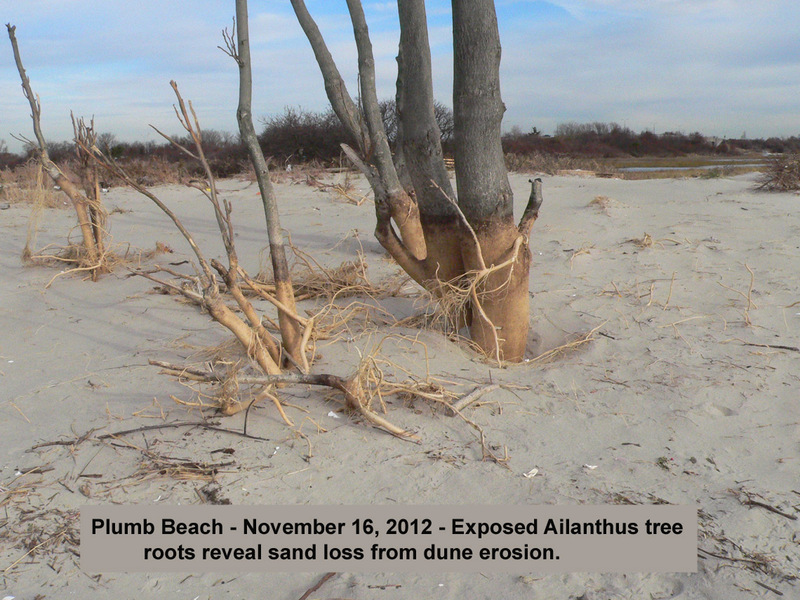 We received another informative update from longtime volunteer and former NYC Audubon board President Ron Bourque, describing the impact Sandy has had on Plumb Beach and Breezy Point Tip. 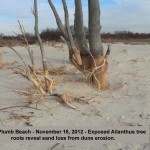 Plumb Beach has been affected by the completion of the beach nourishment project that restored the sand that was lost since the 1992 nourishment. I had a conversation with a USACE project manager who told me that the 3/4-mile sand slurry pipeline would be removed in the next few weeks. Bids for the construction of the rock groins and breakwater should be going out this week. 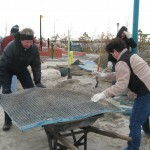 How this part of the project will affect marine life remains to be seen. 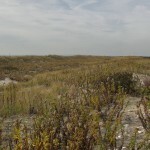 Further east, the erosion of the dunes separating Jamaica Bay from the tidal lagoon has greatly altered the landscape. The drainage channel from the lagoon to the bay remains open for the movement of horseshoe crabs. 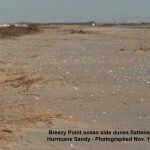 The vast sand flat does hold great promise for next year’s arrival of terns and plovers. The very flatness of this area is an invitation for vehicles to roam far from the beach. Indeed, I witnessed the incursion of two four-wheeled ATVs on those very sand flats and on the remaining dunes on the bay side. They were operated by adults–physically adult at least–and had no license plates. Without a significant increase in NPS staff, the symbolic fencing will not be adequate to prevent incursions into the tern and plover habitat. 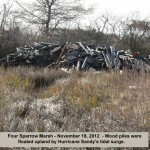 In many past letters/e-mails, I had advocated for the removal of the overburden of tons of wood jetsam that had accumulated on the Mill basin side of Four Sparrow Marsh over the past 75 years. 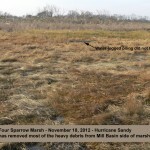 The great concern was how to remove all the debris without tearing up the marsh. It would have been a very expensive operation. 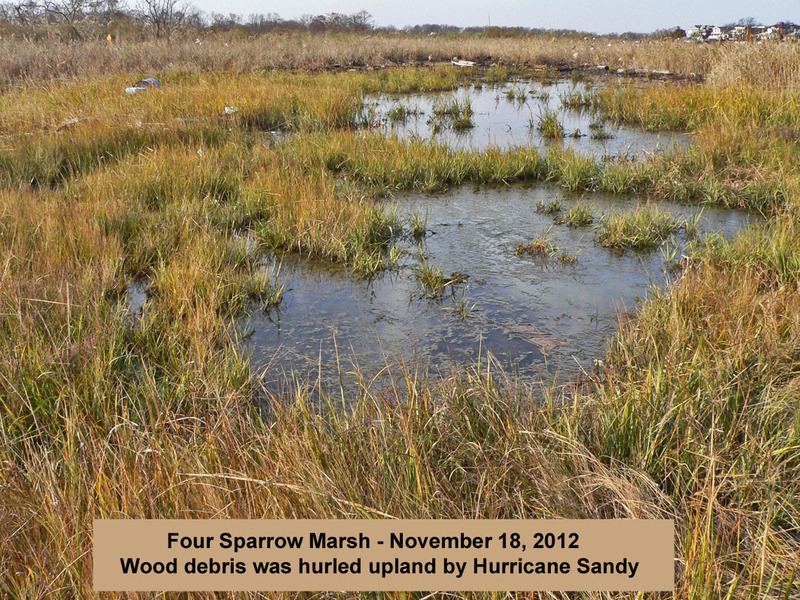 Hurricane Sandy accomplished a Four Sparrow Marsh cleanup the likes of which one could only dream. 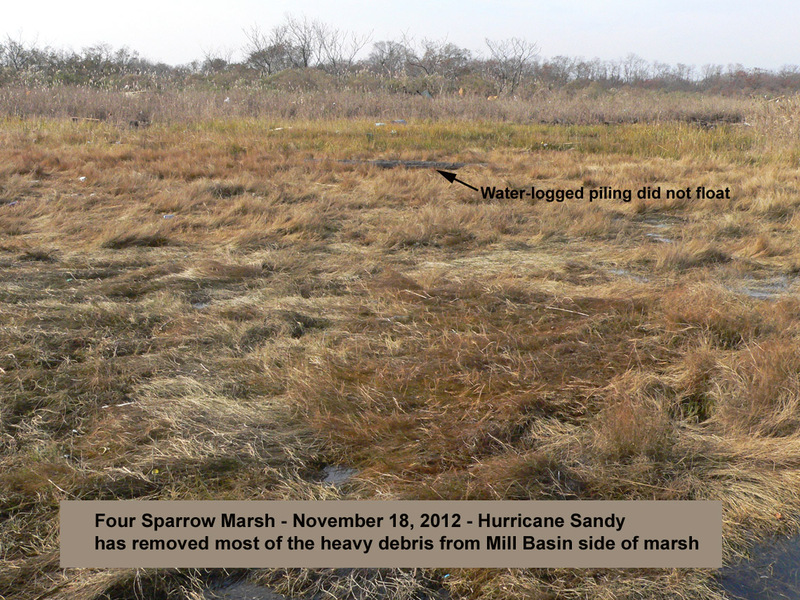 Both the lagoon side and the Mill Basin side of the marsh have been swept clean of 99% of the old debris. 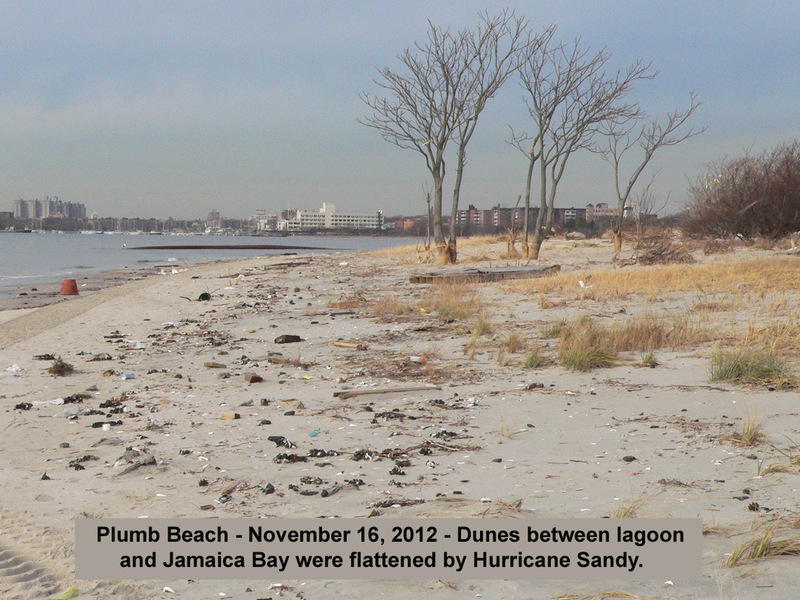 Sandy has essentially swept it all under the rug. More like sweeping the debris behind the couch! 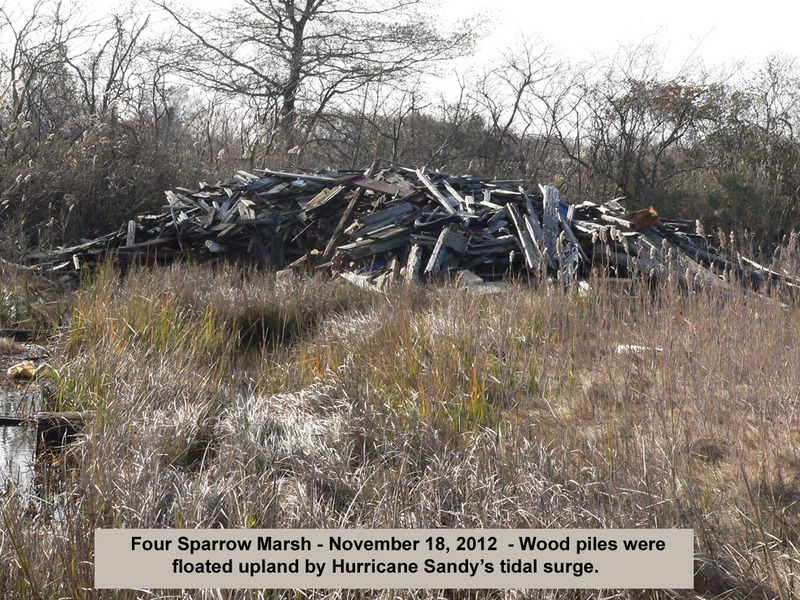 The tidal surge lifted all the floatable wood while the wind hurled it into the surrounding upland shrub/phragmites stands. 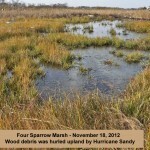 I do hope the salt marsh sparrows respond well to their restored habitat. The great blue herons that normally find shelter in Four Sparrow Marsh through the fall and winter seem to have been driven out by the ferocity of the storm. The record for number of great blues here on a Christmas Count was 11.